I sincerely hope that at least once, you have left this little blog of mine laughing. I'm kinda social, if you haven't gathered that from the various bits of me that are scattered among sweet pictures of my children, recipes, lessons I'm learning, and memories I've captured. So, I thought I'd make this momentous occasion interactive. Read: You get to participate! And since I'm such a sucker for giveaways, I've got an oh-so-fabulous one for you to win. This is one of my favorite cookbooks of all time! I think the Barefoot Contessa is the culinary equivalent to Einstein and she's written a cookbook, Barefoot Contessa At Home, that is full of easy...really easy recipes that are out of this world good. Like Tomato, Mozzarella & Pesto Panini and Buttermilk Mashed Potatoes and Chocolate Cupcakes with Peanut Butter Icing. 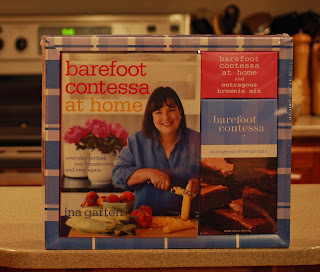 AND, included in this gift pack is a box of Barefoot Contessa Outrageous Brownie Mix. Folks, these are the best boxed brownies my mouth has ever munched on. If you don't like to cook, or if you're a poor soul whose taste buds do not like brownies, this would make some Momma very happy on Mother's Day. So, play along if you'd like. Leave a memory and I'll throw your name in the hat. I'll close comments on Friday (May 2nd) at 5pm EST. And, randomly pick and announce the winner at 8pm-ish. Hmmm memories...well, I think it was the first time that Eric and I came over your house for dinner and we ended up in your living room talking for what seemed like 20 minutes but what was really 4 or 5 hours about what God has done in our lives. Not only what he's done, but the hilarity that ensues with having babies. After that night Eric and I both were so excited to meet new friends that we could actually talk to for hours about anything. It was a blessing that night and the many nights after that we all were able to be together before your big move! Though we aren't able to see each other much anymore due to being states away, I still think and laugh often "at" you and pray for you even more. Miss you and love you! You've made me laugh MANY times, but I always love it when you leave me a comment saying that you'd like to eat at my house. Next to having dinner with you - I think one of my favorite memories would be when we realized just how small the world is and how God has put several people into both our lives! Having chatted for a while and then realizing how close you lived with a "special someone" and that I went to HS with your college roommate. Just that feeling of being even more connected! Makes me smile every time I think of it! Hm. It seems like I have a lot to choose from in the 2 years since we've known each other (wow...has it been that long already?!). From watching you blossom into a pro-texter :) to chasing our kiddos around the Treehouse while attempting adult conversation to finding amazing buys on the sale rack at Gap, there have been many times where I have smiled at the privelege of calling you my friend. But I think one of my favorite memories is the day that you told me that you weren't so crazy about me when we first met. I know that's a disturbing memory to be a favorite, but here's why: You don't tell someone that you didn't really care for them when you met unless that sentiment has changed and a genuine fondness has replaced it. So, it was on that day that I knew that you and I were true friends. The it-doesn't-matter-if-you-haven't-showered-and-my-house-is-a-mess-come-over-anyway kind of friends. And even though our crazy lives don't allow us to spend as much time together as we might like, I am so glad I found a friend in you. (And now I have the song from Toy Story stuck in my head. Ah, sweet motherhood.) Love you! I have several memories that I would love to comment about, but I will limit it to just one. there are a few, but the one that really stands out was only a little bit after i met you here in bloggyland. you wrote something short and simple about you being in the hospital while being pregnant. i thought about how scary it would be to be in that situation so i said a quick prayer for you and your little bean. i continued in prayer over the following few days and kept checking back for any updates. i was impressed that you didn't use your blog for a personal pity party or a vehicle for attention. to me, that spoke volumes to who you are as a person. i also appreciated you then emailing me personally and giving me more information on why you were in the hospital. happy 300 my friend. Oooh... which memory to choose! You're a new friend, but I feel like i already have many fond memories of blog posts and comments and DINNERS and all kinds of things. But it did make me laugh, after I met you the first time, that Jason asked if I had called Josh to assure him that I was still alive. That just makes me laugh. Also, I've loved both dinners with you - they've flown by with tons of encouraging, hilarious, real conversation. So thankful to have you as a friend! I think my favorite memories are of when I first found your blog and was eager to try your recipes! Not being an avid cook, I was happy to find some great tasting recipes with great ingredients and especially ones that came with pictures! I also liked how you allowed me to participate in a gift to a good friend in need. Thanks for so many wonderful bloggy moments! Oh my goodness...how to pick a favorite memory or post or fun little story.... he he he. Presh and hein; the little limp hand wave at your broken down car in the parking lot of Towson. More currently, the day of shopping and sharing life stories over stromboli and buffalo chicken sandwiches; corraling all 6 kids through the mall with Jack and Anna looking like they've come out of a fist fight; watching the Final Four here; there are just too many to choose from. And as for posts, I think that one of the many that made me bust out laughing had to be "What Did Jack Do, Momma?" (11/2/07). The way you put it together just had me rolling. Oh Sar, I have thoroughly enjoyed building our friendship and I am so eager to continue to know you more and love your family as our own. Happy 300th post! Your 300th post - amazing! Congratulations on your accomplishment! Hmm, a favorite post. Truly Sarah I love them all. There are days when I am laughing out loud, days where your words challenge me as a wife, mother, and woman, days when your words bring tears to my eyes. I look forward to your posts daily -reading them is a highlight in my day. Thank you for sharing adventures in your life and your heart with your faithful blog readers. I’m a drop-in reader who found you (and other blogs) by jumping from the McDaris family, to Tara’s family, to yours! I’ve enjoyed reading the blogs from Tara’s, I feel like I’ve gotten to know quite a few of you. Sarah, My first memories of you are at Gram and Pap's house. I was interested in just who was this girl Jason was bringing for dinner. What I loved about you was your love for my grandparents. You were so sweet to them...coming into the kitchen to hug Gram as she loaded up the many bowls of food and Pap as he sliced the roast beef. And you called them Gram and Pap, just like us. You fit right into the family. That takes me to April, 2007, when we all met at OC, MD. What a special time to honor Gram and Pap for their love for each other for 60 years! Thank you for being interested in my little Sierra, asking about the trials and worries, wondering if we would really be able to adopt her. That was a neat walk back to the hotel after our tram ride. I enjoyed watching you with your boys, playing in the pool or on the beach. I don't know if we'll all be able to get together like that again, but wouldn't it be fun! There are so many, Sar!! And I'm so glad that I can share in yours thru your blog...it's invaluable, believe me!! But, one that comes to my mind is our yearly OC trips (a few years in a row) with you and Jay...that was such a precious time for Em and I to spend with you guys. That leads me to that day, the day we got back from our trip and my high school, long-time boyfriend broke up with me...you and Jay were there for me and I felt so comfortable crashing on your couch in tears, weeping over the past 3 years down the drain...haha, seems funny now that I'm married to the man of my dreams, who you've been so honest with me about and come to love, I hope!! :) haha...thanks for all the boy advice and talks! love you! xoxo and congrats on 300 posts! Do you know what is SO funny? I just came here to link you up because today I got the snickerdoodle starbucks drink. How bizarre is THAT timing??? Of all the days, and here you are doing memory day. So, there ya go. Not only was I thinking of you today as I ordered my cinnamon dolce white mocha -- but now I can add it to your special 300th post day! Well I love Dr. Seuss, so I will leave a memory that memorializes yours and mine connection here in blogland, with rhyme. Or was I eating Ham? Did my Cat have a Hat? Did the Lorax stop in? Was the Foot Book on the Mat? Was I on Mulberry Street? Did Horton Hear the Who? Was the Wocket in my Pocket? One fish, two Fish, Red fish, and Blue Fish are not talking! All the while swinging by Pen of Jen's worldwide-world famous Theodor Geisel-laughy wacky Caption Contest! Until I come back again! Since I only know about you through your blog...I remember a video you posted a while back with your family in the snow. It made me smile; it looked so fun! It hasn't snowed where I live since January 1999. Thanks for the fun! I have thoroughly enjoyed your Blog and can't wait to read and look and laugh at 300 more! What a great idea! I've definitely had many a laugh visiting here. Sarah - congrats on 300 posts! You do have a lot to say! My favorite memory of your blog came shortly after I found you. I was reading some of your comments when I saw one by Ginger and recognized that she was "the Ginger" that I graduated with. What fun to reconnect with her! Thanks for being the instrument that made that happen. Of course there have been lots of times you made me laugh too! 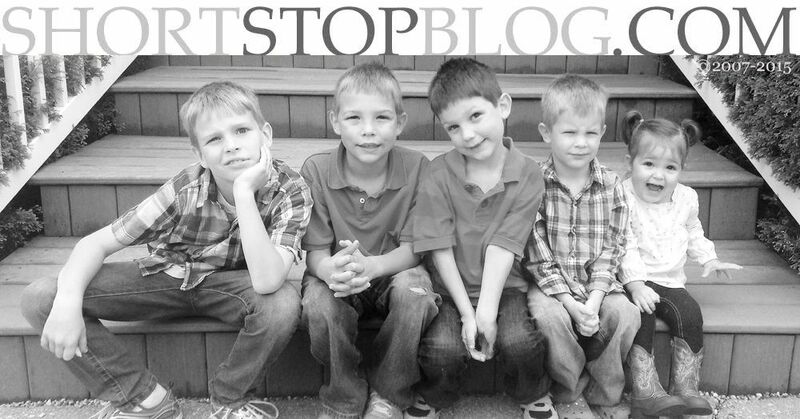 The one that pops into my head is the post about taking the 3 boys out for the first time after Lincoln was born. Thanks for all the laughs, but thanks for all the times you made me think too! 1. The time you told Anna's friend Allison (who was singing along with a tape and was obviously tone deaf) that she had a good voice. In case you don't remember, it was at a cheerleading party at our house on Grand Street - obviously I remember it well!! LOL! 2. Watching you, so tiny in your leotard and fishnets, sing and dance to "New York, New York". 3. Watching "Gallagher" together when you were in your body cast. "There's that thong!" 4. Making a scene at the Cheesecake Factory in Beverly Hills when Anna randomly quoted this from What About Bob? : "You coming here is unbeLIEVably inappropriate!" I'm sure I'll think of many more as soon as I post this, but it's really late and those are some of my favorites. And those are just off the top of my head! Okay, now I REALLY miss you. Happy 300th post! Looking forward to many, many more. Love you!